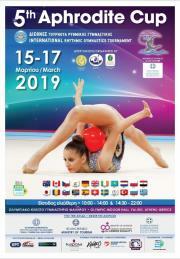 ALL Photos from Barny and ALL Videos from Marc of a single Gymnast or a single RG Group at Aphrodite Cup Athens 2019. The photos and videas are from all routines of a gymnast/group and of the Medal Ceremony. The Videos are Full HD 1920x1080 MOV Files. If you want to get the photos and videos by Download, please choose "Download" as "Way of Delivery" later, so you don't pay shipping costs. You will get an eMail with a link to download a ZIP-File with the photos and videos some days after competition. We do our best to photo all parts of the routines, but it is not always possible for technical reasons. Pre-Orders will be preferred and will get more photos. The prices are only valid during competition days. After competition the prices will be increased by 10 EUR. You can also order and pay cash in competition hall at our camera place. When ordering choose "Cash before delivery" as Type of Payment.